I was reading a post by Paul Thurrott, famed Windows expert, Editor-in-chief of WindowsITPro Magazine, and creator the Supersite for Windows. It was one in which he drops the proverbial hammer on an irresponsible & Machiavellian journalist named Randall C. Kennedy for his heinously deceptive quotes, actions, and most of all, intentions. Kennedy was recently shamed and admonished into unemployment (Translation: FIRED) by his employer, IDG Media for impersonating a person of authority on technical matters under a pseudonym while also magically generating/producing false information about technology – Microsoft Windows in particular. “Good intentions with bad end results.” Eloquently put, Paul. 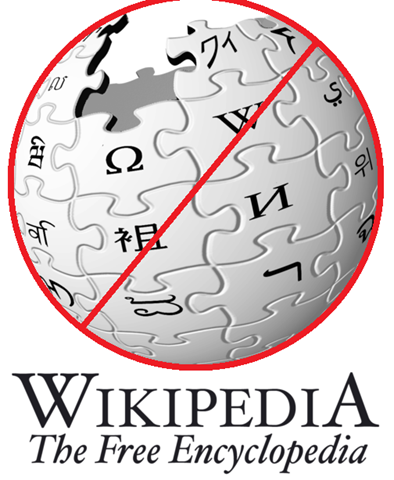 I find it unbelievable that advocates of Wikipedia are completely willing to sidestep & ignore the falsehoods, inaccuracies, and in some instances outright LIES posted on the site, all in the name of community collaboration & contributional parity. Didn’t these people learn anything from the fall of communism? No one should EVER have to vigilantly scour a web site just to defend themselves from lies posted about them without accountability. Want a longer more exhaustive rant? COMMENTARY: Who trusts Wikipedia anyway? The “Right to Privacy”: The Greatest American value ever? While the right to privacy is firmly rooted in the ethical tenets of the library profession, it is also an intrinsic American value, guaranteed by the United States Constitution. Although the Constitution does not explicitly reference the word "privacy," the Supreme Court has nonetheless inferred a right to privacy from various portions of the Bill of Rights and the common law. The most obvious protection of privacy in the Bill of Rights is the Fourth Amendment, which protects individuals in their persons, homes, papers, and effects from "unreasonable searches and seizures" by the government. 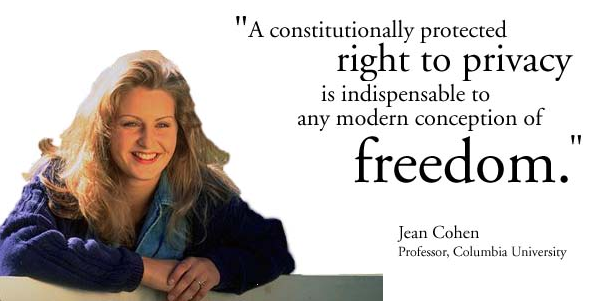 The First Amendment, which protects freedom of religion, speech, press, and assembly, also implicitly safeguards the right to privacy in the form of freedom of thought and intellect. As eloquently articulated by Supreme Court Justice Louis Brandeis in his famous dissent in Olmstead v. United States: "The makers of our Constitution undertook to secure conditions favorable to the pursuit of happiness . . . They sought to protect Americans in their beliefs, their thoughts, their emotions and their sensations. They conferred, as against the government, THE RIGHT TO BE LET ALONE – the most comprehensive of rights and the right most valued by civilized men." The first Supreme Court decision to fully articulate the right to privacy was Griswold v. Connecticut, which held that the right to privacy included the right for married couples to use contraceptives. In Griswold, Justice Douglas, writing for the Court, famously explained that the guarantees in the Bill of Rights have "penumbras," or somewhat hazy, but obviously present, extensions, which must be read as creating "zones of privacy, such as the First Amendment right of association, the Third Amendment prohibition against quartering soldiers in a home, the Fourth Amendment right to be secure in one’s person, house, papers and effects, the Fifth Amendment right to not surrender anything to one’s detriment, and the Ninth Amendment right to not deny or disparage any right retained by the people." In recent years, several federal courts have recognized the right to privacy in public libraries. Specifically, these courts found that the First Amendment protects the right to receive information in a publicly funded library. However, the professional code of librarians provides a much broader promise of privacy than is guaranteed by the Bill of Rights. Consequently, constitutional limitations on the right to privacy are often at odds with the librarianship principles of privacy and confidentiality. Rights of Privacy: An Overview – Ivan Hoffman, B.A., J.D. The Right to Privacy: Does the Constitution protect the right of privacy? If so, what aspects of privacy receive protection? Submitted for your approval: Imagine waking up the in morning, strapping on a GPS the going to work in a taxi with all the details of your travels being recorded throughout the day. Then upon arrival, you put on a video camera & a voice recorder and you have meetings with people, with every action recorded. Then you start making phone calls using someone else’s phone, with all your phone calls, your conversations, duration, etc. being recorded. Then you go down for lunch and buy everything using a credit card but you slide your credit card into a slot for every product your CONSIDER buying, not just the one’s you actually buy. Then after work, you go to a bar and the bartender measures precisely how much you drink & what you drink and records it. Now imagine all that information going a single personal profile that only 1 organization has… on YOU. What does this have to do with the Internet? Wait? Is that so wrong? What’s wrong with being predictable? There’s a lot wrong with being predictable… or more appropriately, being ASSUMED to be predictable. Here’s one example: In TV today, Nielsen ratings are measured based viewership and on market groups. If you are categorized at 18-35 viewer, your opinion is highly-coveted because it is believed by advertisers that the 18-35 market segment is easily influenced. This segment of buyers have people who have not had their routines… their mannerisms… their day-to-day purchases “set in stone”. They can be sold to. Compare and contrast that with the 25-55 market segment in advertising. This is a segment that are considered “older” and “set in their ways”. Thus advertisers aren’t particularly interested in them unless they are selling products specifically for that older group. As a result, the input or the say of the 25-55 market segment is not nearly as influential as that of the 18-35 market. Being categorized is NOT to people’s benefit. It dis-empowers individuals because being profiled means people make assumptions about you before you even get the chance to voice an opinion and be heard. It closes doors and limits people’s opportunities. Okay. So I don’t want to be categorized. If you’re under the impression that the only way people follow you on the Internet to “categorize” you is via “web site cookies”, you’re dead wrong. Cookies are definitely a problem, but they’re just a small segment of the problem. Companies that want to track you to market your presence to advertisers are constantly thinking of new and nefarious ways to identify you so they can watch your behavior and classify your profile. The Electronic Freedom Foundation wrote a series of articles that go into great detail of how companies track you and what the concerns are. They are VERY good reading I encourage everyone to go through them because it’s important that people understand how they are being followed every day by companies such as Google and used for their own gains. Cookies are still a privacy problem for web users, many years after privacy advocates first raised concerns about their use to track web browsing. Today, cookies are one of the main mechanisms that advertising companies like Google use to track and profile users across sites and over time — often building up a single gigantic profile for years and years. Many EFF members respond to this threat by using their browsers’ cookie management features to limit which cookies they’ll accept or how long they’ll be retained. But it turns out that the cookie situation is quite a bit trickier today, and sites that want to track users have new technical options that are hard for users to respond to. The traditional "cookie" is an HTTP cookie, invented by Lou Montulli and John Giannandrea at Netscape in 1994. But today many browsers implement a range of things with the same kind of cookie-like tracking behavior — mechanisms that are far less familiar, harder to notice, and often harder to control. But it doesn’t stop there. Sure tracking your identity is one part of the equation. But how do they aggregate this information to create an overall profile of you? How 3rd parties get to see what you do on the web. Outside of 3rd party tracking, there’s an even more insidious manner in which you are being watched and it’s called “browser fingerprinting”. Your browser presents information AUTOMATICALLY to web sites you visit and this information is a lot more extensive than you realize. It’s so extensive that it’s often uniquely identifiable and traceable directly to your computer regardless of what cookies you block or what safeguards you’ve established. Whenever you visit a web page, your browser sends a "User Agent" header to the website saying precisely which operating system and web browser you are using. This information could help distinguish Internet users from one another because these versions differ, often considerably, from person to person. We recently ran an experiment to see to what extent this information could be used to track people (for instance, if someone deletes their browser cookies, would the User Agent, alone or in combination with some other detail, be unique enough to let a site recognize them and re-create their old cookie?). Our experiment to date has shown that the browser User Agent string usually carries 5-15 bits of identifying information (about 10.5 bits on average). That means that on average, only one person in about 1,500 (210.5) will have the same User Agent as you. On its own, that isn’t enough to recreate cookies and track people perfectly, but in combination with another detail like geolocation to a particular ZIP code or having an uncommon browser plugin installed, the User Agent string becomes a real privacy problem. When we analyze the privacy of web users, we usually focus on user accounts, cookies, and IP addresses, because those are the usual means by which a request to a web server can be associated with other requests and/or linked back to an individual human being, computer, or local network. You are currently browsing the Kurt's Thoughts blog archives for February, 2010.